The large majority of public schools and school districts in the state earned worse grades this year than last on the state’s annual assessment of school performance, according to data released Friday by the State Department of Education. See how your school or district did below. The state’s zero-to-100 grading system takes into account more than a dozen measures, including standardized test scores and how many students are chronically absent, enroll in arts and Advanced Placement courses, graduate from high school and enroll in college within a year of graduation. Test scores, once the lone measure for grading schools and districts, still account for about 80 percent of the ratings for elementary and middle schools. About half of that measure is based on whether individual student test scores show enough improvement to indicate they will reach grade level within five years. That is designed to help the parents and educators judge whether a school is headed in the right direction. Far fewer students this year saw their scores improve enough in math and English to put them on track to reach grade level. That decline was the driving force behind the huge increase in schools and districts that saw their grades drop. “We have a long way to go there,” Ajit Gopalakrishnan, the leader of the State Department of Education’s performance office, told reporters when releasing the results. He said he hopes the results are a wake-up call that prompts educators to question why so many schools and districts are seeing declines. In English, 8.5 percent fewer students are on-trackto reach grade level, and in math, 3.3 percent fewer were on track. Just over half of students are on track to reach grade level. “Growth is where [the department] is putting a lot of its emphasis… It is about saying, ‘Why are some students growing and others are not?” Gopalakrishnan said. Looking at the overall zero-to-100 score, 146 school districts of the 201 receiving a grade for both the 2015-16 and 2016-17 school years saw declines. That’s 73 percent. Fifty districts – one out of every four – saw their scores drop by more than four points. Fifteen districts saw their scores increase by more than four points. In the 10 districts that have been among the lowest performing in the state for years – known as Opportunity or Reform districts where the state has increased involvement – seven saw their grades drop. 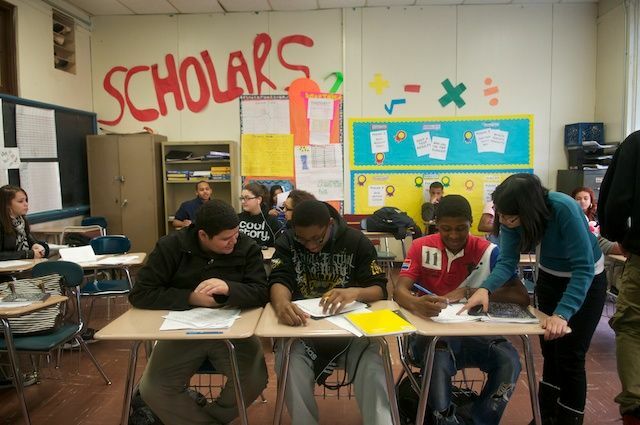 These districts enroll one-quarter of the state’s public school students but 45 percent of students from low-income families and 54 percent of students who understand limited English. Individual schools didn’t fare any better. Of the 1,045 schools, 647 saw their overall scores drop. That’s 62 percent with declines, 3 percent with no change and 35 percent with an increase. Scores dropped by more than four points at 351 schools, or one in three schools. A total of 131 schools saw their scores increase by more than four points. The state has not done an analysis of how individual schools in which they intervened in through the so-called Commissioners’ Network program fared. Other indicators that contribute to a school’s grade – but play a much smaller role – did see some increases. For example, students participating in and passing the exams in high-level courses such as Advanced Placement or International Baccalaureate increased by about 4 percent. It’s unclear where the increases took place and whether white, black, Hispanic and students from low-income families all saw increases. In its release, the department did not break out high-need groups that have historically struggled in school, as it did the previous two years. Also seeing improvement were the rate of students with access to arts courses and those on-track to graduate high school. Gopalakrishnan said the department hopes the results will help schools and districts better understand where to focus their energy and that next year’s results will improve.